Practice writing the alphabet with the LeapReader, and learn about upper- and lowercase letters and letter sounds. Features: Reviews the key elements of writing the alphabet upper and lowercase letters, proper stroke order, letter sounds and handwriting?in a fun, interactive way. Create curved letters with Curly Q and Loopy Lou, explore more linear letters with Straight Up Sue and practice penmanship with Ziggy Zag. Jitterbug with Jimmy Jot and learn about upper- and lowercase letters with dots! Interactive audio support provides instant feedback as children practice their handwriting. 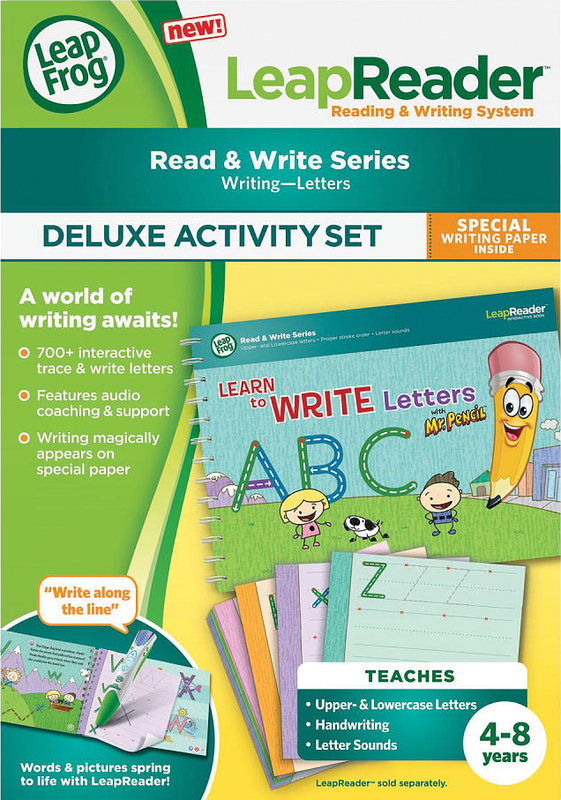 No-mess system includes a deluxe interactive workbook and a Practice Pack with extra LeapFrog Learning Paper to reinforce learning through repetition. As children explore LeapReader books, parents can connect LeapReader to their computer and expand the learning with fun, free activities, printables and tips from experts that reinforce their school skill set. You?ll be able to see their reading and get personalized skill insights. Works with LeapReader? reading system only (sold separately); this title is not compatible with the Tag Reading System. Yes, I want to subscribe to LeapFrog School emails, product news and special offers. ©2001-2014 LeapFrog Enterprises, Inc. All rights reserved.